Games Like Evony: Empire Building MMOs '+g+"
Evony is a popular Flash-based massive multiplayer online (MMO) empire building game with gameplay resembling traditional turn-based strategy. The game is set persistent world during the Medieval period of time. Like any other empire building games the Players have to build their own cities by gathering required resources, recruiting army, making alliances, developing new technologies, etc. In the beginning the players are given "beginner's protection," for a week which protects their city from being attacked by other players. 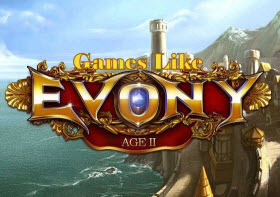 If you are a fan of browser based MMO games like Evony then find the recommendations for it below. Tribal Wars is a free to play browser-based, massive multiplayer online real time strategy game. The game set in the Middle Ages where the player is given with a single village which have to be expanded into an empire by taking over other villages. Travian is a browser-based massively multiplayer online real-time strategy game. In Travian each player begins the game as leader of a small village from where they have to build an mighty empire by fighting and conquering other villages with your allies. Grepolis is a free browser-based MMO online game set in ancient Greece. The players are tasked with building a metropolis from a small town by conquering islands far away through establishing a powerful army and navy over the course of time. Dark Age Wars a free-to-play browser based real-time strategy game set in a medieval world. Each player starts the game with open farmland and abundant resources to gather. The gameplay focuses on gathering resources and growing an army to build an ultimate empire. KingsAge is a browser based MMORTS game where the player is tasked with building an empire with effective use of economic, building and war strategies. World of Warcraft,.....if you can think of more, then don't forget to mention it in comments.